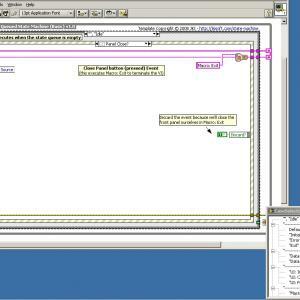 This JKI RCF Plugin sets the Visible Frame property of a Case Structure while the owning VI is running. Use it to follow the execution through the cases in your string-based State Machine/Sequencer when Execution Highlighting isn't fast enough (and, it's never fast enough). The use-case I wrote this to improve is setting a Breakpoint on the Error wire coming out of the main Case Structure and probing the Case Selector terminal so I can float-probe wires during execution. The problem with this is that I had to manually select the current frame every time. This is boring, so I developed this plugin to automatically set the Visible Frame to the case most recently executed. Use - Select the String wire connected to the main Case Structure's selector terminal, invoke the JKI RCF and select StateFollower. Special thanks to - AristosQueue, for his help over here. This tool is a right click framework plug_in. it's use for edit easily string constant in in JKI state machine. 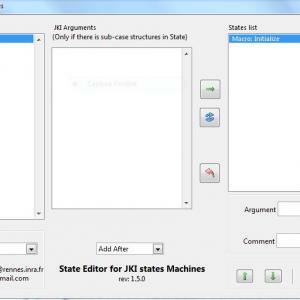 Select one string constant in jki STM structure , run JKi RCF and choose JKI State Editor. This tool is package in .ogpb file. Please use VIPM for installation. If after using this tool, Undo action to return to initial string constant,is impossible. It's bug of scripting feature. Please look this tread for more details. v1.0.0: Initial release of the code. * Now String States constant always grow at left and justify left when modify. * Now only case structure connect to argument tunnel populate arguments list. * You can right click on arguments list and add one case not previously define. Run only if one case structure allready exist and connect to argument tunnel. and lock states when you update it. Like that string constant text become more readable. Colors can be configure in Rcf options. This product includes software developed by the INRA. ARISING IN ANY WAY OUT OF THE USE OF THISSOFTWARE, EVEN IF ADVISED OF THE POSSIBILITY OF SUCH DAMAGE. search for the "JKI State Editor" support page. This tool is a right click framework plug_in. 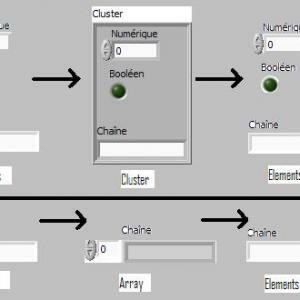 it's use to convert one or few elements ( control or constant) in one cluster. You can convert one element ( control or constant) in array. (if this element is one array, then add one dimension). You can convert too one array or cluster in this element(s). And that without moving anythings. v1.1.0: Terminal and constant are correctly place in structures if need. search for the "Convert-to" support page. Description=Will insert type conversion for all strings, numbers, paths, variants & enums to the right datatype. Tested with 8.6 and 2009. This package contains a plugin for the Right-Click Framework of JKI. 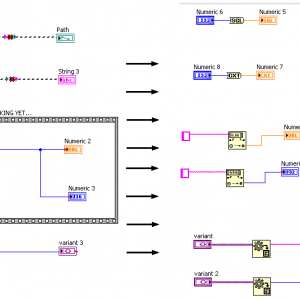 It consists of a first draft of a tool to automatically insert correct conversion node on a wire (or multiple wire at once). - Decimal String to Number. - Float String to Number. - Any numeric type (int, unint, floats, complex) to any numeric type. - Variant to string or numerics. - Unbundle cluster to terminal indicator. After installing package with VIPM, restart the RCF framework. 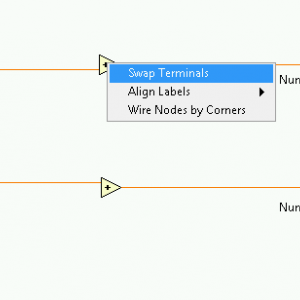 Use the right-click on wires to automatically insert a conversion node if needed. ** VIPM 2010 or higher is required to process this package. 1- Not all typecasts are implemented. 2- Wires with joints will not behave correctly yet. JKI for providing with this great framework. v1.0.2: Added _rcf_ in package name. v1.0.3: Changed the typecast name for proper "type conversion" name. v1.1.3: Fixed bug with conversion from Enum to Numerics. Added conversion from Numeric to Enum using "Variant to Data" node. v1.1.4: Updated the description of plugin that now shows up to date info in RCF Options menu. v1.1.8: Fixed bug when a type conversion node was inserted in a structure where the node was inserted on the main diagram. v1.1.11: Included all files in source distribution to make compatible with LabVIEW 2009.
v1.2.0: Added Unbundle cluster to terminal and corrected problem with Numeric to String. v1.2.0.7: Added Singular to Array & Array to Singular. please go to www.lavag.org and Navigate to the discussion page. 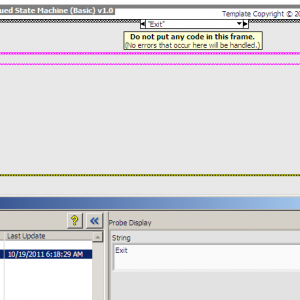 CaseSelect is a plugin for the JKI Right-Click Framework for LabVIEW and is distributed as a VIPM package. I make State Machines with many, many states; perhaps you do, too. I don't like scrolling through long lists of states and have wanted to have a scroll bar on the drop-down list. This plug-in launches a new panel with a Tree control (one that has a scroll bar) containing each of the Case names. I'm still pretty bad at keeping track, but I made a new package. Added navigation buttons to move back and forth through the states you've visited (history) ~ still buggy The original discussion of this can be found here. 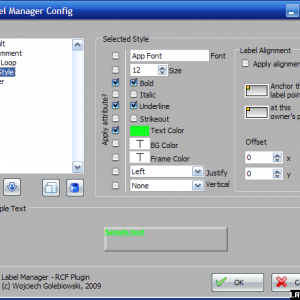 Label Manager is Right-Click-Framework plugin for quick and ergonomic management of text labels styles. Styles are defined as text properties combined with alignment against label owning objects. They may be applied to any text label at block diagram or front panel, also with multiple selection. Once style is set to the label, the assignment is being remembered and may be updated on any change. Initial release of the code. This is a plugin for the JKI Right Click Framework (version 1.0.2). you, simply select the block diagram primitive, activate the JKI RCF plugins and select 'Swap Terminals'. two wires that are wired into different terminals of the same node. 1.0.2-8 Corrected a regression in previous version with bundle/bundle by name nodes. to kake extending it for other GObject types easier in the future. Invoking this plugin from the block diagram allows you to auotmagically align the selected terminal labels to the specified position. 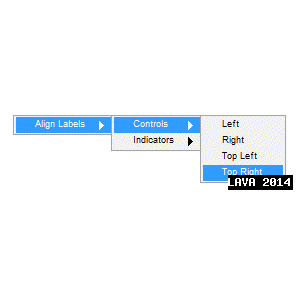 If no terminals are selected, all terminal labels will be moved to the specified position. It has individual selections for Controls and Indicators. This currently does not support any front panel aligning. Hope you find this useful. Let me know if you want more positions or front panel support. This plugin is packaged for use with the JKI VIPM. Download the VIPM package, right click and select "Add To VIPM Library", then select the "Add To Library & Install" button from the dialog that opens. You'll need to restart the JKI RCF to use the plugin.